#1 seeds had a tougher time than anticipated, with only two of the four advancing to the Round of 16. The 8-seed, “Other,” put up a strong fight as well, but PFTCommenter hit the campaign trail hard over the weekend and walked away with a win. The closest matchup of the round occurred between A.J. Daulerio and Punter-Bloggers, with Daulerio edging Punter-Bloggers by a mere 14 votes. It was a good round to be a #2 or #5 seed, as all eight of these entrants emerged victorious. The largest margin of victory in the Round of 32 belonged to Javale McGee, who bested Justin Bieber, collecting 87% of the votes cast. Some critics believe that the timing of the first round was solely to blame for this result, as nearly all of Bieber’s supporters had been unable to access the internet because, as one source put it, “rents took my phone awy for the wknd cuz they thought id spend more time talkin to my grandma lol smh ya rite.” The Who’s Nower Rules Committee has since reviewed and rejected an appeal filed on Biebs’ behalf, upholding McGee’s victory. Onto the Round of 16 matchups! This will determine once and for all what happens when a Deadspin folk hero matches up against a spun-dead faux hero. Oddibe McDowell’s Water Bill will attempt to continue ride the 2013 wave of momentum into the Round of 16 that has already included induction into the Deadspin Hall of Fame, the institution of password protection and a first-round obliteration of Kinja. At the same time, Lennay Kekua will attempt to finish what she* started in the Round of 32 when she* eliminated the other half of the 2012 Deadspin Hall of Fame class, Virgil. The history between these two competitors is no secret. What began as a genuine concern about an eggplant sized poop later transformed into a close friendship between the two, culminating in a PolkPanther sponsored, joint 2011 Deadspin Hall of Fame campaign. 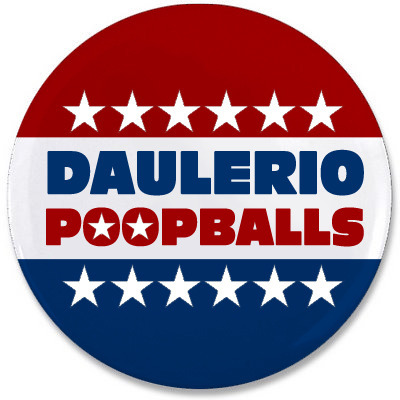 However, a source close to both parties has said that ever since Deadspin Editor-in-Chief Tommy Craggs used his power to overrule the voters and induct Daulerio into the Hall of Fame while leaving Poop Balls out, the relationship between the two has eroded. We’re about to find out what happens when long-winded columns face off against long-winded rants in this battle between two of the biggest ESPN personalities. Simmons benefited from Lynn Hoppes’ ESPN departure early on in the Round of 32, and used that to propel himself to a victory. At the same time, Smith pulled a shocking upset over his colleague, Skip Bayless, setting the table for a long, drawn out battle with Simmons in the Round of 16. The dichotomy between these two opponents speaks for itself, as this matchup will determine once and for all whether or not marketable opinions are more Nower than marketable facts. 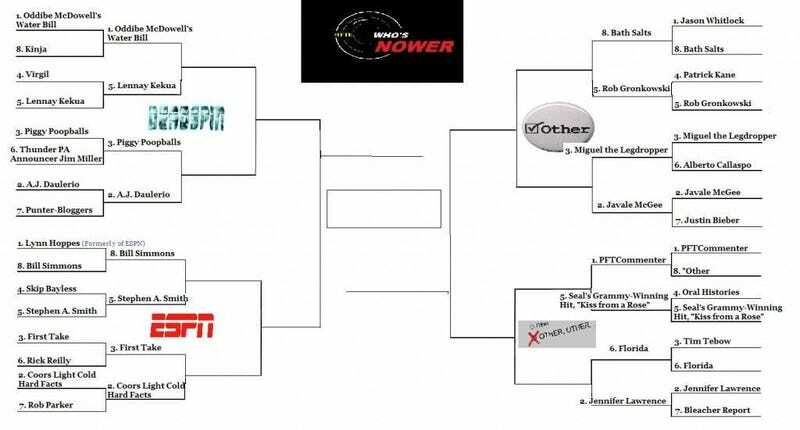 The executives at ESPN will surely have their eye on this contest, and it’s fair to assume that their corporate philosophy moving forward will be directly correlated with the outcome of this battle. If you enjoy tipping back a few cold ones and partying on occasion, then this isn’t the matchup for you. However, if you’re the kind of person who “turns it up to eleven” every single night, without regard for your own personal well being or the well being of those around you, then this is the battle you’ve been waiting your entire life to see. In one corner, we have a substance that has compelled people to eat other people’s faces. In the other corner stands a man who soys fiesta, Gronk. As predicted in the Round of 32, Miguel the Legdropper’s fifteen minutes of fame have already come to an end. Hell, he should probably be thanking the Who’s Nower tournament for providing him with a few more days of relevance. He will face a tough Round of 16 opponent in Javale McGee, who already demolished one pop sensation in the first round. It seems unlikely that a man who intentionally handicaps himself with a 122 character limit on twitter would bat an eye at another teenybopper idol standing in his way, but that will ultimately be determined by you, the voters. I’ll be honest, I am livid with the Who’s Nower Selection Committee for allowing this matchup to take place this early in the tournament. Regardless of the outcome, a great contender will be forced out of the tournament in this battle. PFTCommenter admittedly took his foot [off] the gas early in his Round of 32 matchup against a formidable “Other” opponent, but bounced back nicely to win by a comfortable margin. Seal’s Grammy-Winning Hit, “Kiss from a Rose” is obviously one of the greatest songs ever written, but it remains to be seen whether that will be enough to overcome the strong takes and hard truths that it is up against in this round. This should be one for the ages, folks. After a shocking takedown of it’s native son, Tim Tebow, Florida finds itself staring down another monumental task in the Round of 16, going up against Hollywood “It girl,” Jennifer Lawrence. Florida’s tenacity in the first round did not go unnoticed, as it even received praise from other competitors in the field. At the same time, Jennifer Lawrence put up a dominating performance in the Round of 32, collecting 79% of the votes cast. This one could go either way. Now that we've set the table, head on over to Heading for the Exits to cast your votes now!